Two hundred and fifty years ago in the Ukranian city of Berditchov, a great Chassidic master guided his followers along a passionate and uplifting path. With his actions, he conveyed the excitement and beauty of living life as an eved Hashem; with his words, he taught them exalted teachings filled with the bright light of his soul. Those teachings instilled in the chassidim a tremendous awe, love, and yearning for Hashem. Peering through the window of his messages, they were able to catch glimpses of heaven. 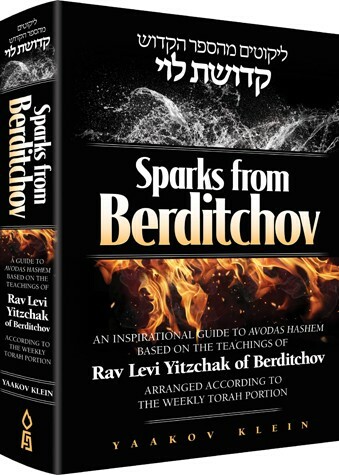 Sparks from Berditchov seeks to draw the beautiful teachings of Rav Levi Yitzchak out of the quaint cobblestone streets of Berditchov and carry them into the twenty-first century, using the fire within to kindle the neshamos of our generation. In this beautiful book, the teachings in Kedushas Levi are illuminated by the words of a diverse spectrum of Torah leaders such as Rebbe Nachman of Breslov, the Ba'al HaTanya, R' Chaim of Volozhin, Ramchal, and the Peleh Yoetz. Together, they form a complete guide toward an exhilarating avodas Hashem, and, thereby, toward a life bursting with utmost meaning and fulfillment. In our generation, where a Yiddishkeit bursting with relevance, beauty, and life has frozen over, it takes brilliant sparks of inspirational fire to warm up our souls. Sparks of chizzuk. Sparks of emunah. Sparks from Berditchov.